You all want to grow your business in the roofing industry and increase profits, but the key to success is in the sell. Some contractors are better at selling than others, but you can learn from the mistakes you make when reaching out to potential customers—and turn your business around and stand out from the competition. Be sure you look professional. Don’t enter a home looking disheveled or dirty. While you may have been working on the roof beforehand, it’s important to clean up in order to make a good impression. Also, dress professionally—you don’t need a suit and tie, but wearing a polo shirt with your company’s logo makes you look professional yet approachable. Remember, you are selling yourself as well as your company’s services. Always listen to the homeowner. Part of a contractor’s job is to listen to the problems homeowners are facing and come up with a solution. Even if you’ve heard them all before from another customer—listen to their issues. Be empathetic if they have had severe damage and be very focused on responding to their personal needs. Offer financing. Roofing is an investment, so to soften the blow of the price tag, it’s important to offer customers financing and pre-qualification. Homeowners likely don’t know they can finance a roof and may put off a much-needed replacement if they can’t afford it outright. Let them know you can make it affordable for their budget. Give the choice of designer shingles. Many contractors are not comfortable offering a premium shingle, but a GAF survey found that contractors closed more sales when they offered more than one shingle choice. Lay out all the options for the homeowner and let them decide if a few extra dollars a month is worth the upgrade. Learn how to sell designer shingles now so you are ready to present them later. Educate the customer. 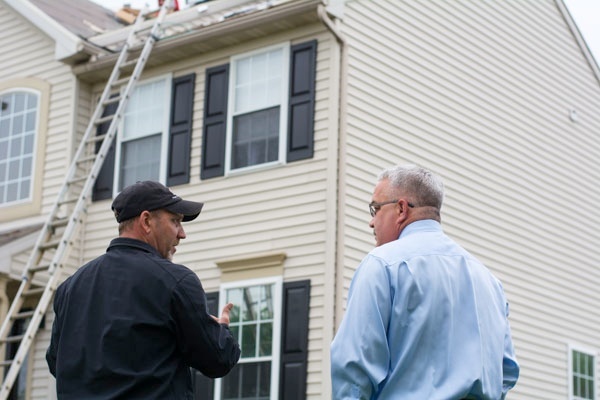 Explain exactly what the roof repair or replacement process entails, but make sure your sales pitch speaks to the homeowner personally. If you are selling to a couple, be sure not to leave the woman out of the loop. Are you selling to a millennial couple? Know your audience. Also, don’t neglect explaining the benefits of a maintenance plan that can extend the life of the roof. Inspect the roof and attic. Shady contractors knock on doors and tell homeowners there’s a problem with the roof without actually documenting it and explaining it to the homeowner. It’s a scare tactic. Do an inspection and show them proof of issues by taking pictures and pointing out and explaining the problems. Use social media. Social media is a great sales tool to get your name and information out there. Connect to manufacturers, customers, and colleagues to promote your services, promotions, and information. This can help you increase your credibility in the industry. Need help? Check out our Q&A on how to get started. Utilize references and referrals. The key to growing your business and selling your services is to provide references and referrals from other happy homeowners. In an age of peer reviews, people want to know about the experiences of others. Ask for references from past jobs and share them with potential new customers. Also, find out if they know anyone else who needs roofing work done and ask them to refer you. Take advantage of digital tools during the sale. Selling has gone digital with tablets and apps, and it’s a great way to help homeowners visualize color and style on their roof. Utilize some of the GAF apps to help homeowners choose the right roof for their home. Explain enhanced warranties. Warranties can be confusing for a homeowner to understand, so it’s important for a contractor to explain their benefits. A warranty can provide the homeowner with peace of mind that their investment is protected and that you will be there to help maintain and take care of their roof for the life of the term. Some certified contractors can provide even longer enhanced warranties or enhanced warranties that cover their workmanship to even further differentiate themselves from the competition. By focusing on upping your game, you can take your business to the next level. Good luck selling!